The program is in the advanced stage of its pilot phase. For the test phase, the system has being installed on 15 El Al planes. Israel's national air carrier is getting ready to install WiFi systems in its flights to Europe. The program is in the advanced stage of its pilot phase. Initially, the system is being implemented on 15 El Al planes: the five Dreamliners that the carrier has received thus far, all eight Boeing 737-900 jets, and two 737-800s. The system will allow passengers to use smartphones, tablets and laptop computers, to surf the web, connect to their email accounts, use applications and enjoy the social networks. They will also be able to listen to their own favorite music and watch movies, independently of what entertainment the airline provides. Don Buchman, vice president of Viasat, which supplies El Al with its WiFi, told Arutz Sheva that the company is also responsible for placing the satellites in orbit that bring "the best WiFi to the sky". 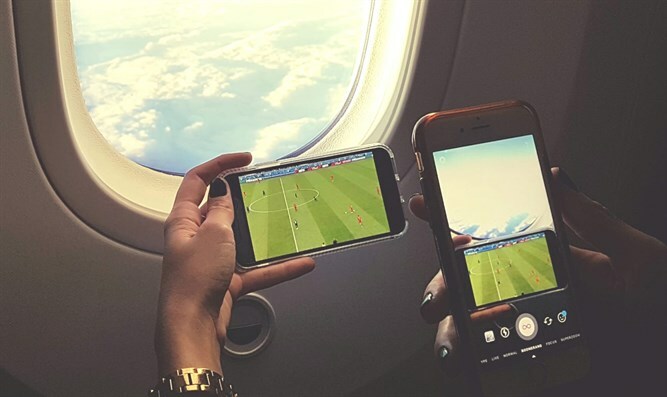 Buchman said that passengers are able to stream World Cup video simultaneously while surfing social media thanks to the cutting edge technology of the company's KA-band satellites, combined with the newly installed WiFi.